Using a free-standing mixer with a dough hook attachment (if available), pour in the measured out ‘Dry Mix’ ingredients. Mix ‘The Liquid’ ingredients together into a measuring jug. Then slowly pour the liquid into the mixer while kneading on a low speed for around 2 minutes until all the water is mixed into the flour. Once combined, turn the speed up to high speed for a further 2 minutes until the dough has a smooth-yet- tacky feel to it. Once the dough has been well kneaded, dust with 2 tablespoons of flour, scraping off any additional dough on the sides of the bowl. Shape the dough into a rough ball, and then coat lightly with 1 tablespoon of vegetable oil, cover the bowl with a damp cloth and leave aside in a warm, preferably moist, draft free location (like inside a room temperature oven) for 1 – 1.5 hours. Once the dough has doubled in size, you can then shape it into whatever shape you wish before steaming. Steam times will vary between 8 – 15 minutes depending on the shape and size of your finished buns (the thinner the bun, the shorter the steaming time). Flatten chicken thigh if needed by cellophane wrapping and using a rolling pin. Dip chicken thighs in the beaten egg and roll in panko bread crumbs. If you wish to have extra an extra crispy outer shell, repeat by dipping in egg and rolling in panko again. Test how hot the oil is in the deep fat fryer by using a pair of disposable wooden chopsticks. If it bubbles you are ready to pop the chicken in. Add the chicken and deep fry for 5-8 minutes. 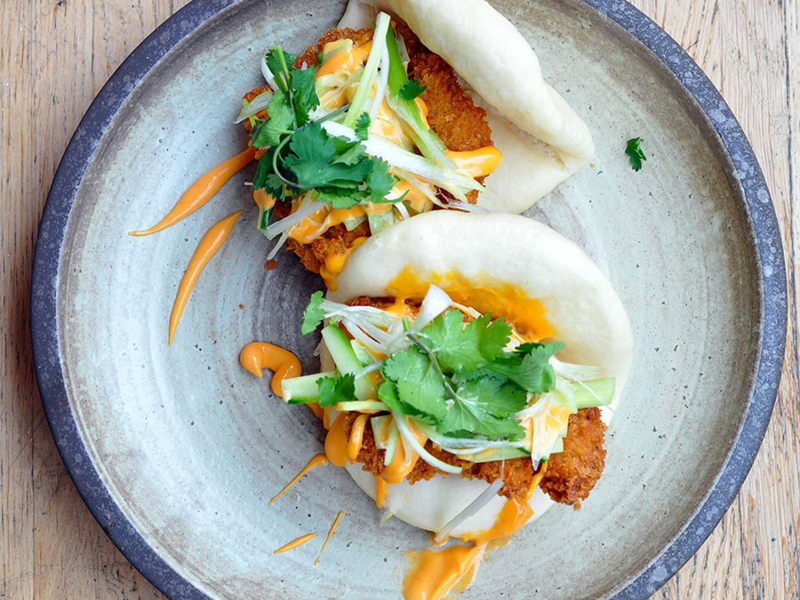 Once the chicken is cooked, pop into your bao buns and serve with your filling of your choice with a splash of sriracha mayo and enjoy!